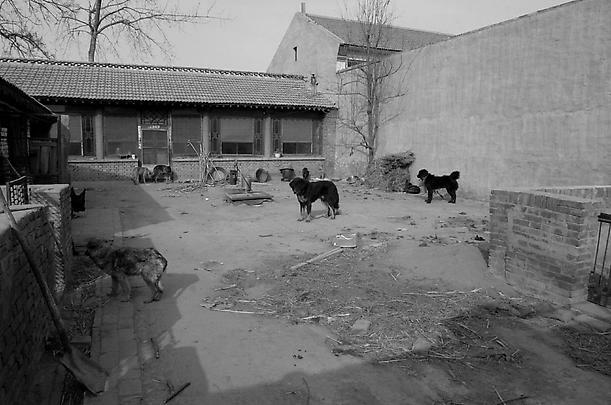 Marian Goodman Gallery is very pleased to announce a solo presentation of Yang Fudong's six channel installation, East of Que Village 2007, which will be on view May 6th through June 20 2009. This will be the first New York presentation of the work, first commissioned by Tate Liverpool for The Real Thing: New Art from China and presented there in 2007, and shown at Bonniers Konsthall, Stockholm, 2008, and MUKHA, Antwerp where it is currently on view thru June 2009. 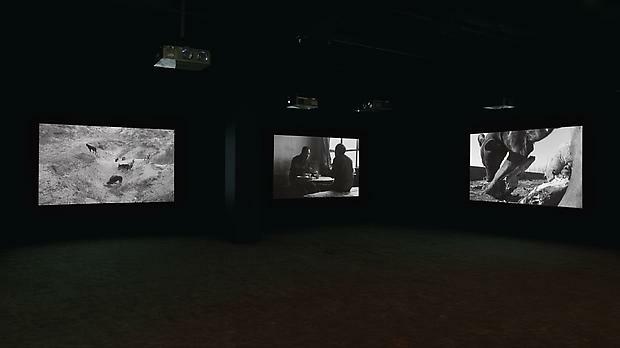 The exhibition of East of Que Village also coincides with Yang Fudong's solo exhibition of the epic five part film, The Seven Intellectuals in a Bamboo Forest I-V, 2003-2007, currently on view at The Asia Society through September 13th, which was seen in entirety in 2007 at the 52nd Venice Biennale, Venice, Italy. One of China's best known young artists, in East of Que Village (2007, 6 screens, b&w, 20', 50"), Yang Fudong diverges from the erudition and urbanity of Seven Intellectuals, delivering a highly personal film that focuses on the sense of isolation and loss increasingly present in China's contemporary society as communities are scattered, traditional rural villages dissolved, and the fight for survival takes precedence. 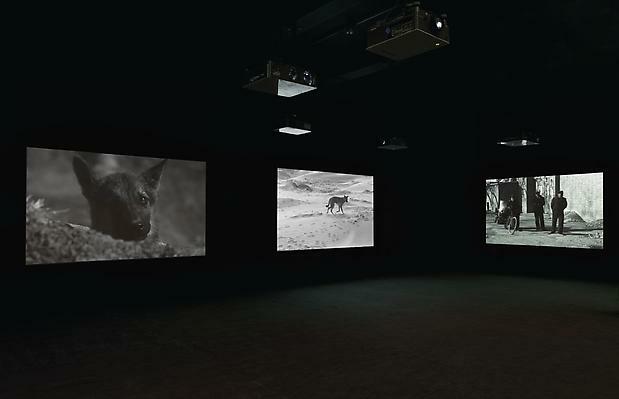 The imagery is of a desolate and hostile landscape, the host to a group of wild dogs fighting a merciless life-and-death struggle for survival, with only a sporadic presence of human life and social values. catalogue 'Seven Intellectuals in a Bamboo Forest' (2008, Stockholm & Beijing) "In 1991 Yang Fudong went south to Hangzhou, the old imperial city Marco Polo praised to the skies for the beauty of its freshwater lakes, its pleasures, pavilions, and delights; centuries later, its reputation of paradise remained intact. Yang Fudong went there to study oil painting at the Zhejiang Academy of Fine Arts, which would soon be renamed the China Academy of Art… The time was auspicious. A decade before, the Academy had become an inspired center of new experiment. Removed from the political imperatives of the Central Academy in Beijing, the Academy in Hangzhou was a place to think, to paint, to talk, to read. The state culture of realism was opening further… at the Academy they were listening to everything that came. Texts circulated. The circles of influence were unpredictable, unstable, electric" .." They watched a video of Joseph Beuys' 1974 performance in NY where he arrived in an ambulance and then, wrapped in felt, lived in an art gallery, confined with a coyote and working on co-existence, claiming 'I Like America and America Likes Me." In 1996 he took classes in the Department of Photography at the Fine Arts Academy and the Film Academy in Beijing. 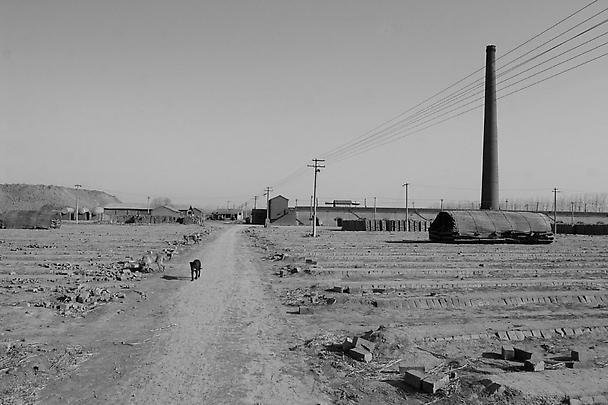 Developing a painterly approach to his lens-based photographic and film work, Yang began by depicting characters set against this familiar landscape until, after his move to Shanghai in 2002, he occasionally turned his focus to urban settings and to the polarity between city and country life. His films and installations are known for their atemporal and dreamlike quality, long, suspended sequences, dividing narratives, and multiple relationships and story lines. Much of his work has addressed the ideals and anxieties of a new generation -- a developing society still in the process of adjusting its consciousness to the material conditions of the times. His films often depict his characters as cognizant, or sometimes not, of the traditions, values, and weight of the past. "Since his emergence on the contemporary Chinese art scene in the late 1990s, Yang Fudong has become recognized as a talented visionary amongst the younger generation of artists in China, and unique amongst those working in video or film. Even the video works have a sublime, cinematic quality that could be compared in sensibility to the films of Ingmar Bergman or Andrei Tarkovsky, or August Strindberg or Dostoevsky in literature. But despite these comparisons, Yang Fudong's visual references and rhythms remain firmly rooted in his own cultural context, and relate strongly to Chinese cultural sensibilities. This is particularly evident in the poetic, ambiguous and veiled structures around which the films revolve –of the individual shots as much as the sense of narrative. Although it is perhaps to date most readily admired in the film-styled series 'Seven Intellectuals in a Bamboo Forest', the same cultural sensitivity is firmly visible in this work, 'East of Que Village'… which sees Yang Fudong return to his birthplace, and which invokes all the sentiments accorded this place in literature and historic drama, as geographical fact and Chinese ethnographic myth." -- (Karen Smith, The Real Thing (cat. ), Tate Liverpool, 2007). Yang Fudong's Seven Intellectuals in a Bamboo Forest is currently on view at The Asia Society, New York through September 13, 2009. 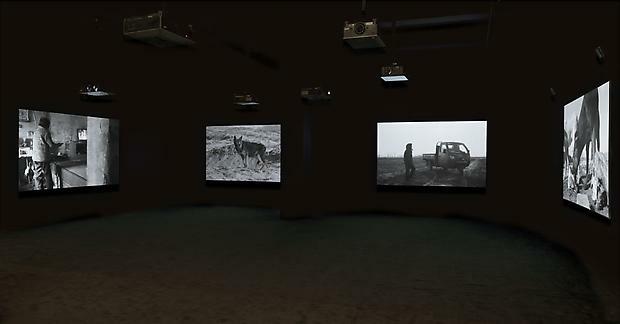 Yang Fudong's work is also on view at the MCA Denver through May 10th. Upcoming projects include an important new work which will premiere in Performa '09 this coming November. Recent one man shows have been seen at Jarla Partilager, Stockholm; Arthur Sackler Gallery, Smithsonian Museum, Washington; Artist's Spotlight, Sundance Film Festival, Sundance, Utah (2008); Phoenix Art Museum, Phoenix (2008); Parasol Unit, London (2006); Stedelijk Museum, Amsterdam; Castello di Rivoli, Turin; Kunsthalle Wien, Vienna (2005); Renaissance Society, Chicago (2004). Important group exhibitions include The 52nd International Art Exhibition/ La Biennale di Venezia, Venice, 2007; The Real Thing: Contemporary Art from China, Tate Liverpool, 2007; Asia Pacific Triennale of Contemporary Art, 2006; The Carnegie International, Carnegie Museum, 2005; Liverpool Biennial, 2004; Time Zones: Recent Film and Video Art,Tate Modern, London; Chinese Pavilion and Utopia Station, the 50th Biennale di Venezia, Venice, Italy, 2005. Please join us at the opening reception on Wednesday, May 6th , from 6-8 pm.